What Are UL 752 Bullet Resistant Guard Booths? Whether you manage a military complex, government agency, or any facility that warehouses expensive goods, safety and security are likely your top concerns. Threats of violence lurk around every corner and security managers must constantly find ways to make their perimeters more secure. 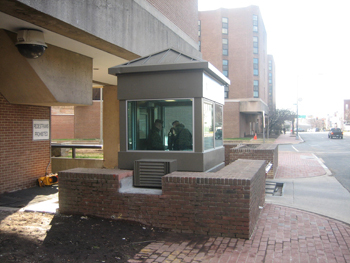 One effective means of protection are bullet resistant guard booths. But what is bullet resistance? And just how well does it ward off the threat of attack? Find out in today’s blog, below. Do you understand the ins and outs of UL 752 Bullet Resistant Guard Booths? Bullet resistance is measured by determining the type and amount of ammunition that the material is capable of stopping without breaking. Bullet resistance is both for glazing as well as for the steel of the structure. Shelters Direct only fabricates UL752 bullet resistant booths in steel. The UL 752 outlines 8 different levels of resistance. Most everyday businesses that face the risk of robbery are well-suited to a resistance level of 1-3, whereas more secure facilities such as military installations may require a higher level of bullet resistance. The levels determine the actual thickness of the glazing and steel plate that is placed on the exterior walls. Level 1 can withstand 3 shots from a gun using 9mm full metal copper jacket bullets with a lead core. Level 2 will resist .357 Magnum Jacketed Lead Soft Point ammunition and can handle 3 shots. Level 3 can be used against up to three .44 Magnum Lead Semi-Wadcutter Gas Checked bullets. Level 6 can withstand the velocity of five 9mm Full Metal Copper Jacket with Lead Core bullets. Level 7 offers protection from five 5.56mm full metal copper jacket with lead core rifle bullets (.223 caliber). Level 8 can resist five 7.62 rifle lead core full metal copper jacket military ball bullets (.308 caliber). By choosing the right level of bullet resistance for your facility, you can better ensure the safety and security of your employees, clients, and visitors. This entry was posted on Friday, April 15th, 2016	at 1:41 pm	. You can follow any responses to this entry through the RSS 2.0	feed. Both comments and pings are currently closed.